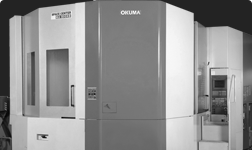 When your business calls for a machine that delivers high productivity without compromising on accuracy, look to the MA-H Series of horizontal machining centers. This proven design platform boasts a series of engineering features guaranteed to achieve results. A high-speed axis feed of 60 m/min provides near instant access to parts, improving productivity and nearly eliminating the need to hold inventory. A wide range of spindles offers full horsepower from low to high RPM’s. And for extremely high accuracy, Okuma’s double sleeve spindle cooling system balances the spindle head temperature to prevent deformation and ensuring continuous, consistent accuracy. The MA-H Series is the place to turn for the fast creation of precision-crafted components, a true advance in profitability. 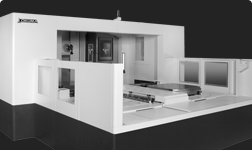 Stable and precise horizontal machining center. 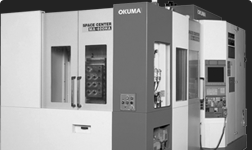 Powerful horizontal machining center with large carrying capacity.